Plot: A single mother agrees to look after her friend's son only for her friend to vanish. Hitchcock this isn’t, but you suspect The Master would watch this with a wry smile on his face. They don’t make the kind of ‘90s airport read type thrillers anymore. When they do they tend to be longform TV shows. The kind of shows that allow for a cliffhanger ending of each episode while twisting and turning forcing you to watch just one more. So A Simple Favour is a welcome, albeit tongue lodged in its cheek, return to the kind of films that John Dahl made his name with. Stephanie Smothers (Anna Kendrick) is one of those mums who volunteers for everything because she leads a lonely life. Blogging in her spare time she meets Emily (Blake Lively) a glammamum who swears like a trooper, drinks like a sailor and flirts like the husky-voiced femme fatale you kind of know she is from the get-go. But when Emily goes missing Stephanie sets out to uncover what happened to her knew BFF. Dark, twisty and with a fun tinge of comedy, A Simple Favour is essentially Gone Girl-lite. That sounds like a criticism but it’s not, in fact it’s a big compliment. Because while it is not a patch on David Fincher’s brutal deconstruction of marriage, A Simple Favour is second-guessingly good fun. Does it sometimes jump the shark? Yes. Do you forgive it because you’re swept up in who is conning who? Absolutely. In the main part it works because of two wonderfully funny central performances. Kendrick goes from her usual demur girl next door to Single White Female in a slow unhinging and manically impish way. Lively meanwhile chews up every scene playing an over-the-top Real Wife Of Heaven/Hell. Together they could go up against the entire cast of Desperate Housewives, take them on in a fight and come up without a hair out of place, a bloody trail of martinis glistening behind them in a vogue like cover-photo. 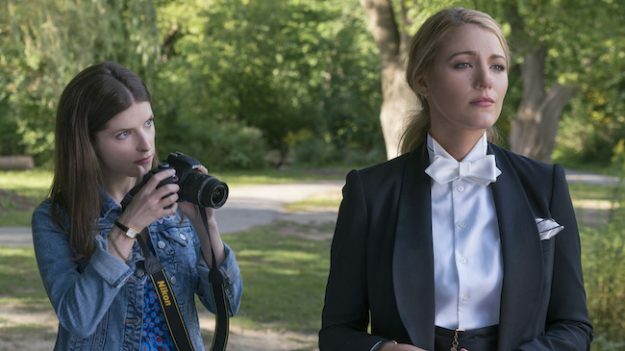 Paying homage and sending up all at once A Simple Favour is a deliciously fun take on a genre that has all but died out in mainstream cinema. When it goes too far you forgive it, when it doesn’t quite send up enough you’re hypnotised by the glossy visuals. Hitchcock this isn’t, but you suspect The Master would watch this with a wry smile on his face.